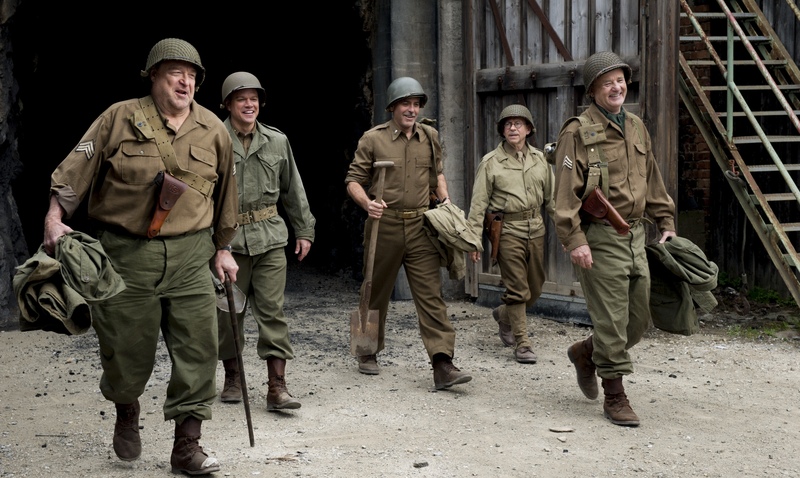 Until the theatrical release of “The Monuments Men,” George Clooney’s work as a director was universally brilliant. With “Confessions of a Dangerous Mind,” “Good Night, and Good Luck,” “Leatherheads” and “Ides of March,” Clooney proved himself a self-assured leader with a distinct and engaging cinematic voice. Sadly, these qualities are missing in “The Monuments Men,” a standard-order World War II movie that is as forgettable as it is nostalgic. The film does, however, mean well, and it focuses on an underreported piece of history. Loosely based on Robert M. Edsel’s non-fiction book “The Monuments Men: Allied Heroes, Nazi Thieves and the Greatest Treasure Hunt in History,” it centers on the efforts of the Monuments, Fine Arts, and Archives program set up during the later stages of the war. The goal of the program was to preserve works of art as Allied forces marched toward victory. The program was also a recovery effort, as many masterpieces had been lost to Nazi plundering. Although several hundred people were involved in the actual preservation effort, Clooney’s film narrows the focus to seven men and acts as if they were the lone heroes. In fairness, this condensation was probably necessary for dramatic purposes. Focusing on such a tight group of individuals, allows viewers to form an emotional bond with the characters. It also allowed Clooney to assemble a sort of super-cast. He plays Frank Stokes, the leader of the team, and his supporting players include Matt Damon, Bill Murray, John Goodman, Jean Dujardin, Cate Blanchett, Hugh Bonneville and Bob Balaban. This is an impressive group of performers, but it doesn’t produce the fireworks one might expect. The main trouble is the pacing. Although Clooney – who penned the screenplay with Grant Heslov – focuses on just a few characters, he breaks them up and sends them on missions throughout Europe. Because of this, the film frequently cuts from one setting to another, and nobody receives the screen time or character development needed. Beyond that, much of what takes place is slow. Only a handful of sequences place the characters in serious peril and, while these are the best moments in the film, they are spaced too far apart to get the plot chugging. As a result, one must have a particularly strong interest in the subject matter to remain fully engaged. Clooney does a nice job with the visuals, and the film has a sweet, sentimental tone that is missing in many war dramas. Unfortunately, good intentions don’t produce a good movie. “Pompeii” may be named after the Roman town destroyed by the eruption of Mount Vesuvius in 79 A.D., but its star-crossed love story could have played in any location within the Roman Republic. Although the film takes pains to recreate Roman life, it is clear that director Paul W.S. Anderson and his cohorts are more interested in their characters than they are the history of Pompeii. James Cameron’s 1997 blockbuster “Titanic” also takes this approach to history, but “Pompeii” isn’t as refined as Cameron’s film. That’s mostly because the movie’s romantic center lacks the finesse and development Cameron gave “Titanic.” It’s also because “Pompeii” is trying desperately to play to both men and women. Because of this, the romantic angle is countered by lengthy action sequences. The action is possible because screenwriters Janet Scott Batchler, Lee Batchler and Michael Robert Johnson chose to center their story on Milo (Kit Harington), a young, Celtic horseman who watches as Romans brutally kill his parents. Alone and unsure, Milo is captured by slave traders and eventually turned into a gladiator. While Milo is being transported to Pompeii where he is to participate in gladiator games, his group has a chance meeting with Cassia (Emily Browning), daughter of the city’s ruler. Although Milo and Cassia speak only briefly, it is clear that they have a connection. When Milo arrives in Pompeii, their paths cross again, but a romance seems impossible because of Milo’s position as a gladiator. Anderson uses this setup to place viewers in the arena with Milo and build hope that he may someday unite with Cassia. To this point, the film is a cross between “Gladiator” and “Romeo and Juliet.” Then, the history kicks in. In a movie called “Pompeii,” viewers can reasonably expect Mount Vesuvius to erupt, and Anderson does not disappoint. As the volcano grumbles and spits fiery rocks toward the city, Milo and Cassia search for one another. The lovers must also attempt to overcome the treachery of an evil Roman politician played by Kiefer Sutherland. The story is predictable and trite, and one wonders what might happen if a director set a more compelling narrative in the doomed Roman city. Still, as weak as the plotting is, Anderson deserves accolades for his depiction of the eruption. It is loud, fiery and appropriately brutal. It is also an extremely impressive visual experience, particularly when viewed on Blu-ray 3D. One could argue that the Vesuvius eruption is worth the price of a rental on its own. It is difficult, however, to justify the 70 minutes that lead to this climax. Harington and Browning give respectable performances, and there is nothing inherently offensive about the love story. There is also nothing to set it apart from the countless film romances that have come before. Nothing, that is, except fireballs and lava flows. Blu-ray and DVD extras include two making-of features and a filmmakers’ commentary. When “Vampire Academy” hit theaters, it was a financial disappointment, which isn’t surprising considering the quality of the product. One wonders, however, why the target audience failed to show. Like most supernatural romances, “Vampire Academy” is squarely aimed at tween girls who (as a group) don’t have particularly discerning taste. The case in point is the “Twilight” films, which range from moderately bad to awful, yet produced huge numbers at the box office. Based on Richelle Mead’s novel, “Vampire Academy” tells the story of 17-year-old Rose Hathaway (Zoey Deutch), a supernatural warrior known as a Dhampir. The Dhampir are trained to protect a race of good-hearted vampires known as Moroi, and Rose has a particularly strong connection to her Moroi best friend, Lissa Dragomir (Lucy Fry). It is therefore assumed that Rose will eventually become Lissa’s guardian, and she has already assumed the role unofficially. Rose and Lissa live under constant threat from powerful, evil vampires known as the Strigoi, and they also face the problems of average teens. These include relationship issues, bullying and other high school pitfalls. “Vampire Academy” is best described as “Mean Girls” meets “Twilight,” only it isn’t as sharp and funny as the former or as brooding and dark as the latter. Instead it’s an offbeat mash-up that never finds its stride. One gets the feeling director Mark Waters wanted a film that would be both funny and exciting, but “Vampire Academy” is neither. The movie is too melodramatic to work as a full-fledged thriller, and it possesses a seriousness that eats away at the comic edges. Deutsch gives Rose a likable reading and Fry is respectable as Lissa, but the plotting and screenplay don’t give them enough to work with. Blu-ray and DVD extras include an alternate opening, deleted scenes and a conversation with Mead. Edward Zwick’s 1986 version of “About Last Night” is an understated gem, making it a ripe candidate for remake. The question is why we need a new version of this story when the original is both good and readily available. The answer, of course, is we don’t. Little is new in the 2014 version, as both movies are based on the David Mamet play “Sexual Perversity in Chicago” and both focus on two couples undergoing relationship ups and downs during the course of a year. Michael Ealy stars as Danny, a straight-laced restaurant supply salesman who enjoys hanging out with his much-wilder pal Bernie (Kevin Hart). When Bernie begins dating the equally wild Joan (Regina Hall), Danny is introduced to her roommate, Debbie (Joy Bryant). This leads to a presumed one-night stand that becomes serious. The primary differences between the new and old versions of “About Last Night” are casting and a modernization of the setting and characters. These things may make the film more appealing to younger viewers, but they don’t add much for fans of the original. Hart is a likable actor, and his version of Bernie is charming, despite the fact that the character is overly mouthy. Ealy is a strong leading man, and his reading of Danny is appealing as well. Hall and Bryant handle the female roles capably, and all of the actors have reasonably good chemistry. Unfortunately, a fresh cast doesn’t change the fact that this movie was already made – and made quite well – some 28 years ago. This new version of “About Last Night” is passable, but it lacks sparkle. Because of that, most viewers will do well to shelve the new version in favor of the picture that inspired it. Blu-ray and DVD extras include a featurette on the making of the film. Throughout much of his career, director McG has mixed broad humor with fast-paced action, and only on occasion has he found the correct formula. His latest feature, “3 Days to Kill,” demonstrates how wrong things can go when the mixture is off. The movie centers on Ethan Renner (Kevin Costner), a veteran CIA operative who is remarkably good at killing people. During an important mission, Ethan collapses, awaking to learn that he is suffering from terminal brain cancer. With only months to live, Ethan decides to repair some of the damage his career inflicted on his personal life. So, he reaches out to his ex-wife, Christine (Connie Nielsen), and their estranged daughter, Zooey (Hailee Steinfeld). Both women are reluctant to see him, but Christine softens when she learns that Ethan is dying. She even allows him to watch Zooey while she goes out of town on business. In the meantime, a seductive CIA agent named Vivi Delay (Amber Heard) offers Ethan a drug that could extend his life, but only if he helps her with a critical mission. Seeing no other option, Ethan agrees. This leaves him juggling his responsibilities as a father and as a spy. Viewers are supposed to find humor in the dichotomy. Unfortunately, it’s not very funny. McG plays his action sequences straight, and some are remarkably realistic. These never properly mesh with the script, which is peppered with quirky comic lines that feel like Quentin Tarantino throwaways. Costner isn’t particularly good at delivering the comic bits, and Heard, Steinfeld and Nielsen don’t help. The manic presentation leaves viewers wondering whether they’ve signed up for a thriller or a farce, and this makes it difficult to invest in both the characters and the situations they face. Blu-ray and DVD extras include an extended cut of the movie and a behind-the-scenes feature. “Like Someone in Love”: This 2012 drama by Iranian director Abbas Kiarostami focuses on a part-time prostitute who forms a powerful connection with an elderly client. The movie was nominated for the Palme d’Or at the 2012 Cannes Film Festival, and the Criterion Collection is delivering a fine home video treatment complete with a 45-minute, making-of documentary. Presented in Japanese with English subtitles. “In Secret”: Drama about a young, 19th century woman (Elizabeth Olsen) whose illicit affair leads to tragedy. Oscar Isaac, Tom Felton and Jessica Lange also star. Written and directed by Charlie Stratton. “Grand Piano”: Story of a concert pianist (Elijah Wood) who returns to the stage despite a crippling case of stage fright. The already stressful situation is compounded when he discovers a note indicating that a sniper (John Cusack) will kill him if he plays a single note incorrectly. Directed by Eugenio Mira. Whoopi Goldberg Presents “Moms Mabley – The Original Queen of Comedy”: Goldberg makes her directorial debut with this documentary about Jackie “Moms” Mabley, a groundbreaking comedian who influenced a wide range of artists. The movie includes performance footage of Mabley and interviews with performers ranging from Eddie Murphy to Kathy Griffin. “The First World War” – The Complete Series: All 10 parts of the 2003 documentary series shown on The Military Channel. The 523-minute work considers the most important moments of the Great War, and it includes archival footage. “L.A. Law” – Season Two: Twenty episodes of the 1980s and ’90s TV drama about employees of a high-profile law office. Harry Hamlin, Susan Dey, Corbin Bernsen, Jill Eikenberry, Jimmy Smits and Blair Underwood star. “Happy Days” – The Fifth Season: Twenty-six episodes of the classic TV sitcom focused on U.S. life during the 1950s and ’60s. Ron Howard, Henry Winkler, Tom Bosley, Marion Ross, Anson Williams, Donny Most, Scott Baio and Suzi Quatro star.